Biography: Sunetra Gupta is an acclaimed novelist, essayist and scientist. In October 2012 her fifth novel, So Good in Black, was longlisted for the DSC Prize for South Asian Literature. In 2009 she was named as the winner of the Royal Society Rosalind Franklin Award for her scientific achievements. 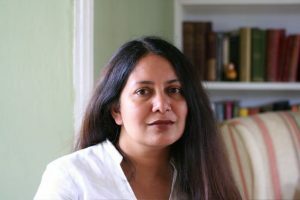 Sunetra, who lives in Oxford with her husband and two daughters, is Professor of Theoretical Epidemiology at Oxford University’s Department of Zoology, having graduated in 1987 from Princeton University and received her PhD from the University of London in 1992. Sunetra was born in Calcutta in 1965 and wrote her first works of fiction in Bengali. She is an accomplished translator of the poetry of Rabindranath Tagore.